NEW WATERFORD — It’s been a couple of month’s work on bad weather days, said Village Administrator Jason Gorby. He’s figuring the in-house work of renovating the community building at Village Park Drive (East Main Street) could have cost around $50,000 if contracted out. 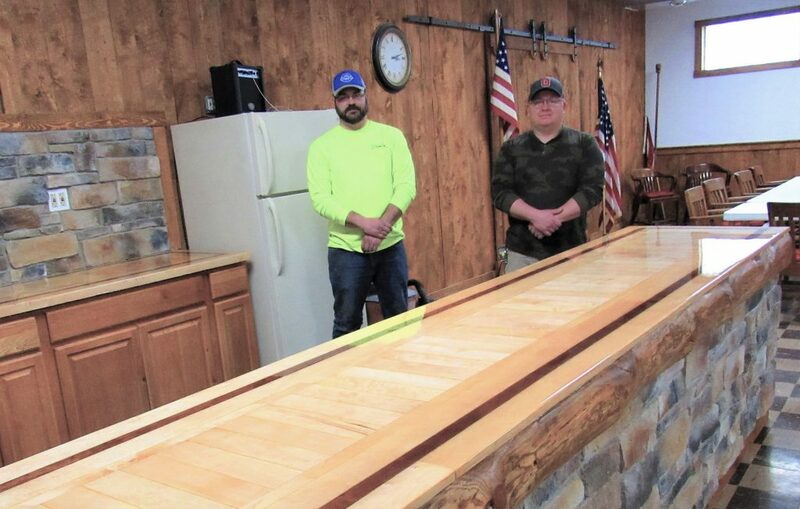 Instead, when the work was caught up and bad weather made indoor projects look good, the village put the time to good use by using the personal skills of village employees for an in-house project. Ken Wilson, a street department worker, contributed his skills and tools, while street and utility department employee Brandon Gates, and Ken Hess, water/sewer plant operator, and Gorby all brought individual expertise to the job. “Chad and Brandon kept the water plant going and then helped out here in the community building,” Gorby said. They all contributed wood-working and craft skills along with getting a good deal on wood from Mark Cope’s nearby sawmill. All the wood cost about $800, Gorby said while figuring the in-house project cost was right around $11,000 so far, or about one-fifth of the cost if the work was contracted out. The project was something Mayor Shane Patrone wanted for villagers who can rent the center for local events like weddings, reunions and parties. “When we got started we were just going to clean it up, straighten the walls and drywall it,” Gorby said of what turned into a fairly substantial remodeling job. It was a lot of wood working, sawing, fitting and plumbing, said Hess, who estimated the community building, which houses the police department and village offices, was probably built in the 1950s. The walls, which Gorby said were out of square, are fresh white above the chair rail and the serving counter was rebuilt using wood from the old bowling alley that was located where the village gazebo stands today. Gorby laughs, recalling how Patrone said that one way or the other part of the old bowling alley will be preserved in the community building. It is, and in a rather spectacular countertop form. Patrone said it was important to keep some history of the bowling alley. So today, the long piece of wood-craft standing in the back of the 2,200 square foot room, is a real centerpiece that represents a part of the labor of love they put into it. Gorby is especially happy with the way it turned out with a shiny, professional glaze top. He has photos of the how the bowling alley wood looked before it became a countertop. There are also the “barn doors” which slide open along the rear wall. The board is used as the display screen for an overhead video projector for classes. “Ninety-nine percent of the in-house labor we did ourselves,” Gorby said, adding the lowered ceiling and dressing up the restrooms lies ahead. The new restrooms will be on the west side of the building and designated for men and women and handicap accessible. The old records room is being converted to a restroom and the old restroom on the east side of the building will become the records room. The acoustics have already improved, even without the dropped ceiling. Sometimes the air conditioning had to be shut off during council meetings because of noise, owing to the old, hard walls. That problem has already been taken care of. Hess said, “The echo is gone,” and Patrone also mentioned it, adding they’re working on saving money for the ceiling and that will help even more. Gorby said they all live in the village and threw themselves into it.